Scientists recently discovered massive mountain peaks higher than 10,000 feet. As we reported over the weekend, scientists found out that Saturn’s moon Titan has a huge mountain range with one peak reaching 10,000 feet into the alien sky. It’s just the latest bit of evidence that there is perhaps no more interesting moon in the solar system than Titan. Using observations from NASA’s Cassini spacecraft, scientists were able to determine that the highest peak on the moon is 10,948 feet — a far cry from the 30,000 or so feet of Mount Everest, but not far off some of the highest peaks in the United States. And that’s pretty impressive for a moon like Titan that is nowhere near as large as Earth, according to a NASA Jet Propulsion Laboratory statement. 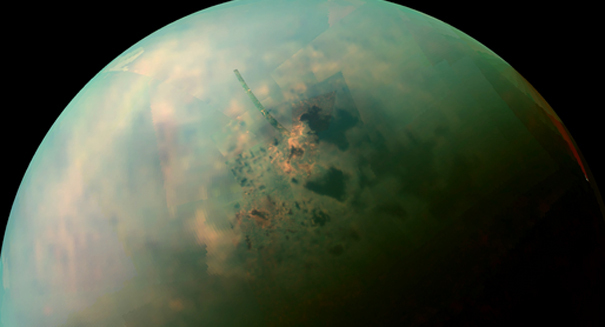 Titan is fascinating for a lot of reasons. It’s Saturn’s largest moon, and the second largest moon in the solar system, with only Jupiter’s Ganymede more massive. It is 50 percent larger than our moon, and it is actually larger in volume than Mercury, the smallest planet (although Mercury has it beat on mass due to much higher density). And it has some very unusual attributes. It is the only natural satellite in our solar system that has a thick atmosphere. Scientists are also interested in Titan because it has stable bodies of surface liquid — the only other body other than Earth where that has been shown to be the case. It wasn’t until the Cassini Huygens mission of 2004 that we truly understood what lies beneath Titan’s thick atmosphere on its surface and realized all the exciting possibilities in terms of the study of life that it offered. But now that we know it’s there, Titan is certain to be one of the primary subjects of future NASA missions deep into our solar system.